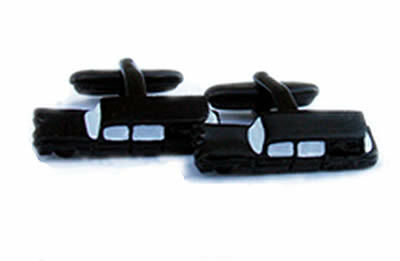 Hand painted, 3 dimensinal, hearse cufflinks. The hearse is a retro, 60's style model, with a black body and white accents on the windows. They are a 3d design which adds to their uniqueness. These links have a fun, bubbly vibe, making them a great gift for anyone in the funeral biz! Make sure to check out our matching hearse tie bar and hearse stick pin!